In the third pAsuram, AzhwAr says “You who are the cause for brahmA et al, came to me without any reason, and made me fully sustain by you only; now, you should fulfil the remaining task as well”. In the previous two pAsurams, his being the cause of the universe and his attractive nature are explained; previously, his being the goal is explained; now his being the means is explained. See nanjIyar‘s introduction. kIrththiyinAy – oh one who is having glories! thalaippeyvan – will reach and enjoy! 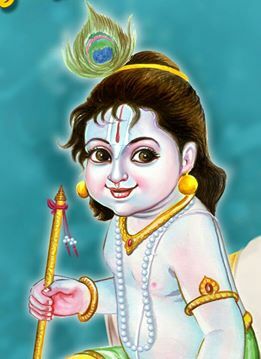 kAththa em kUththAvO – previously, AzhwAr spoke about krishNa’s activities “Anirai mEyththu avai kAththa em kUththAvO“; after saying “eththiRam“, he would repeatedly say “eththiRam” and be immersed in it; being reminded by what he said previously, he is saying “kAththa em kUththAvO“. pUth thaNduzhAy … – AzhwAr is explaining the specific identity for each entity. punai konRai am sem sadaiyAy – Are the existence of others, free from your control? Just as the existence of the cows is under your control, isn’t the existence of those who consider themselves to be lords, under your control as well? punai … – rudhra, who has beautiful, reddish matted hair which is decorated with konRai garland, is at your disposal. vAyththa en nAnmuganE – Just as the garlands are distinguished identities for the respective entity, as explained in the previous phrases [for emperumAn and rudhra], for brahmA, his four faces are specifically given for the task he is set out for [i.e. creation]. Further, even if ISwara vows “let me create this way”, it will be impossible to do, looking at brahmA’s apt creation [vAyththa nAnmugan – brahmA, the apt person for creation]. en – for this, the focus is on viSEshya (emperumAn who is the object who has the viSEshaNa (attribute)). While speaking in context of vaiyadhikaraNam (dealing with different entities – i.e. emperumAn being the lord of different dhEvathAs), it will lead to bewilderment to separate him from the dhEvathAs and also to consider it to be talking about kEvala bEdham (simple difference) only; but when explained in context of sAmAnAdhikaraNam (dealing with different entities which have a common base – i.e. emperumAn being the antharAthmA of all these dhEvathAs), it will highlight the lord/servant relationship. So, the result of both vaiyadhikaraNam and sAmAnAdhikaraNam, is his total control over others; yet, there is special reason in explaining this in the context of sAmAnAdhikaraNam. As said in SrIrangarAja sthavam 2.87 “svam udhdhiSya“, emperumAn did all these for his own sake only. As said in this SlOkam “upAththE saththA sthithi niyamana Adhyai: chidhachithau svam udhdhiSya” (upanishaths are saying that SrIman nArAyaNan accepts the existence, protection and control of all chith (sentient beings) and achith (insentient entities), for his own sake), since starting from existence to everything else is at his disposal, one’s total dependence on emperumAn is such that one cannot engage in pursuing other means separately. vandhu en Ar uyir – Should I speak about your favours towards others? Is it not sufficient to see the favours you have done for me? By revealing your form/nature to me, you brought me to the state where I cannot exist without you, whereas previously I was totally engaged in worldly activities and had not even see you in my dream. Eththa arum kIrththiyinAy – When I who was made to exist by you, set out to praise you, would it be possible for me to praise you? unnai enguth thalaippeyvanE – How will I pursue some means and reach you? Is there even anything like that [myself pursuing and reaching you]? This entry was posted in thiruvAimozhi, thiruvAimozhi 7th centum on September 18, 2018 by Sarathy Thothathri.